Women have made vast strides over the past few decades. Women occupy higher levels of workforce participation and take on more leadership roles than ever before. These accomplishments should be acknowledged, celebrated and utilized in building programming for all girls. Although women have more opportunities than ever before, many girls still face systemic barriers and oppressive practices that negatively impact their personal growth and development. On a daily basis, girls deal with issues related to their physical and mental health, body image, gender and self-esteem (Iglesias and Cormier, 2002). A large percentage of young Canadian girls also deal with poverty, racism, homophobia, transphobia and sexism on a daily basis. Violence against women and girls also continues to be a serious problem. 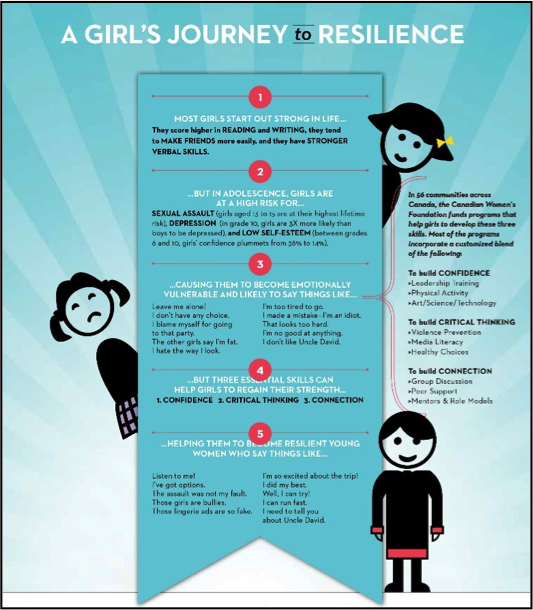 Early adolescence is a turning point for girls. It is a time of transition when girls begin to question and form their own individual identities. During this period, some youth may expand their ideas of gender expression. There are high expectations of what a girl should ‘be like.’ At this stage, girls often begin to deal with the gendered roles of adult femininity which can be confusing and restricting for many (Kaplan and Cole, 2003). By engaging these young girls in mentoring, programs can step in at a fundamental time in their development and exploration. Community programming that focuses on the strengths and successes already in the lives of adolescent girls can be a powerful way of supporting and empowering them further. By accepting girls for who they are and how they identify, and seeking to build youth capacity to navigate the challenges and experiences of adolescence, mentoring can support girls at the height of their development. Girls-only programming allows girls a safe space to explore their identities, create positive relationships with others and focus on their unique strengths and capabilities. It provides a nurturing environment for girls to engage with older female role models, creating immense potential for growth, acceptance and support. Girls-only spaces can create space for discussion that encourages girls to question stereotypes, talk about bullying and speak up against oppression with their peers. This creates an atmosphere where girls can build the skills and confidence needed to challenge oppression for themselves and others. Group mentoring is an approach that affords young adolescent girls the opportunity to, as the APA suggests, engage in conversations about issues they’re facing in the context of both peer and adult supportive relationships. Group mentoring occurs when one or more mentors is matched with two or more mentees. Group mentoring sizes and match ratios vary, depending on the program goals, type of mentor and available resources. It has been theorized that group-based mentorship practices are more accessible to marginalized youth than traditional one-on-one mentoring partnerships (Herrera et al., 2002). Individuals who may not feel comfortable participating in one-on-one mentoring may be more likely to do so in the context of a group, where they might still benefit from having a supportive mentor and supportive peers. Girls-only group mentorship can provide a positive space where resources can be shared and discussed. There is strong evidence that suggests that girls, specifically as they enter adolescence, benefit from more intimate, psychosocial relationships (Denner & Griffin, 2003). Girls group mentoring can also be particularly valuable for organizations with limited resources or in communities with limited numbers of mentors. By matching the girls in groups, the program can include more girls and have potential for greater impact. What is the Canadian Women’s Foundation’s approach to Girls Group Mentoring? Since 2006, the Canadian Women’s Foundation’s Girls’ Fund has supported dynamic programs for girls between the critical ages of 9 and 13 that engage their body, mind and spirit. Building on the Girls’ Fund and creating greater opportunities for girls, the Nancy Baron Mentorship for Girls Program was launched with generous funding from The W. Garfield Weston Foundation. Mentoring is widely recognized as a highly effective way to promote leadership, increase exposure to diverse perspectives and experience, and build confidence through relationship building. Mentorship participants are connected to a small peer group, then matched with a mentor or mentors, allowing the girls to form relationships with and learn from both their mentors and their peers. Program format is customized by each organization and based on the particular needs and assets of the community it serves. For example, some programs match high school age mentors to build leadership in teenage girls. Other programs pair elders or older mentors with youth to strengthen understanding and respect between generations. Program staff take on the critical role of running the program, recruiting and supporting mentors and girls, as well as overseeing the mentoring relationships to ensure they have a safe, effective and supportive impact. Volunteers take on the role of mentors. Every program uses a comprehensive, skills-based, girl-centred approach. Priority is given to the most disadvantaged girls, and opportunities for Indigenous girls and girls in Northern communities is a high priority. Peer learning for service providers is an integral part of the program: half of the programs started their group mentoring in the first year of their four-year funding, while the other half used the learning from the first group to launch their mentorship programs in the third year of the funding cycle. Canadian Women’s Foundation also prioritizes knowledge sharing. Organizations across the country have the ongoing opportunity to join in the discussion and learn about gender-based group mentoring through online learning and in-person trainings. Through careful evaluation, there is greater understanding of how to develop and deliver group mentoring for girls between the ages of 9 and 13. It provides a comprehensive offering of best practices, learning opportunities and resources to help impact and improve services for girls across the country. Canadian Women’s Foundation also worked closely with five community organizations to pilot this toolkit. These organizations partnered with Canadian Women’s Foundation to test the toolkit over a six-month period and actively participated in an ongoing reflection and evaluation process. The focus of the pilot was to evaluate the toolkit’s value and functionality, and to engage in a collaborative and continuous learning and improvement process. Through these learnings, we have been able to evolve the content of the toolkit to better meet the needs of the organizations looking to develop a girls group mentoring program. Cornerstone Family & Youth Inc.